Asian markets showed resilience Tuesday to the emerging-markets selloff that had been hitting global markets, with shares broadly mixed and Asian currencies gaining some strength. The Hang Seng Index Index HSI, +0.42% reversed Monday’s steep losses and was recently up 0.4%. 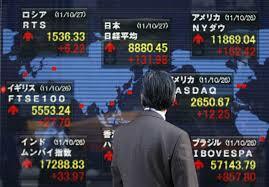 Meanwhile, the Nikkei Stock Average NIK, -0.12% was recently down 0.2% even the yen rose 0.2% against the U.S. dollar. The pair was last trading at 108.18 yen; it crossed the critical ¥108 mark earlier in the morning session. “I don’t think the dollar’s uptrend will be disrupted easily, but it would not be a surprise to see an adjustment of speed,” said Takuya Kanda, a senior researcher at Gaitame.Com Research Institute. Investors took profits in the currency pair after it touched a five-month high of ¥108.54 overnight, he said. The S&P/ASX 200 XJO, -0.35% was recently down 0.5%, following an overnight decline in commodity prices. BHP Billiton BHP, -0.97% was 0.7% lower and Rio TintoRIO, -0.84% fell 0.7%. A sharp rise in commodity prices has helped the country’s growth outlook improve at the end of a long resources boom, the Reserve Bank of Australia said in comments published Tuesday. Korea’s Kospi SEU, -0.01% was down 0.1%, reversing earlier gains, and Singapore’s FTSE Strait Times STI, +0.52% was up 0.4%. Asian currencies broadly got a reprieve Tuesday. The Thai baht and the Taiwan dollar were up 0.3% against the dollar according to Thomson Reuters. The Indonesian rupiah, which has been battered by the flight of capital to higher-yielding U.S. assets, was up 0.2%. The Malaysian ringgit meanwhile remained under pressure and was down 0.2%, paring earlier losses in the day. The Korean won gave up early gains to trade flat against the greenback. A strong dollar drove the yuan devaluation, with the U.S. Dollar Index on Monday surpassing 100 for the first time since last December. But concerns of drastic capital outflows from China — stemming from a surge in U.S. 10-year Treasury yield — have eased over the past two days, said Zhu Bin, an analyst at Southwest Securities. “Growing bearish sentiment on the U.S. bond market may hold off the Fed’s plan to hike rates,” Zhu said. Asian traders were briefly optimistic last week that the policies of U.S. President-elect Donald Trump would lift Asian markets and economies, McKenna said. Trump has promised to roll out a large fiscal stimulus, lower corporate taxes and vastly increase infrastructure spending. That optimism turned sour after U.S. Treasury yields jumped, pulling cash from Asian emerging markets. Investors bet that a Trump-driven inflation would give the U.S. Federal Reserve room to rapidly raise interest rates. Meanwhile, expectations of an interest-rate increase influenced trading in the region. Japanese banks rose following gains in U.S. financial stocks overnight on expectations of higher bank rates. Additionally, Trump’s promise to dismantle Dodd-Frank, which was instituted after the financial crisis to limit the level of risk banks can take, has been welcomed by the sector. Among individual stocks, Mitsubishi UFJ Financial 8306, +4.46% was up 4.3%, Sumitomo Mitsui Financial 8316, +3.81% climbed 3.9% while Mizuho Financial gained 1.2%. Meanwhile, Asia-Pacific government bonds extended losses Tuesday, with Malaysia’s 10-year debt yield touching a near 10-month high and Singapore’s 10-year debt yield climbing to 2.4%.